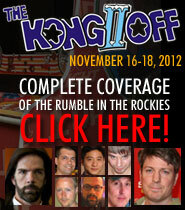 As documentaries go, The King of Kong was a big deal. It has become a bona fide cult classic on video, not to mention one of the most critically-lauded films of 2007. Millions of people have cheered Steve Wiebe on in his struggle for high-score recognition, and quite a few of those people have been inspired by Steve and the movie to take their shot at competitive gaming's most famous and coveted leaderboard. Every time it is re-released, Disney's 101 Dalmatians leads like clockwork to huge (and problematic) spikes in dalmatian adoptions. Back to the Future made everybody want a DeLorean. The effect of films and TV shows on cultural fads is well-documented. It has been nearly five years since King of Kong debuted. 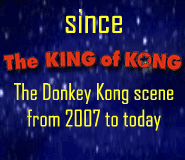 Not surprisingly, the majority of all Donkey Kong scores ever submitted to Twin Galaxies (nearly three quarters of them) have come since 2007, without any doubt as a consequence of the movie. And yet, the Donkey Kong competition pool, while well out of proportion to normal classic gaming standards, remains small relative to the degree of public awareness it has enjoyed over the last decade. There are still fewer than 300 players on the (combined) Donkey Kong leaderboards. So where are all the new competitors? Why has there not been the hundredfold (or even tenfold) increase in participation that some might have expected? I'd say the modest increase in the number of competitors is actually just about right, and I can think of a few possible reasons. It's safe to assume that one must have easy access to the Donkey Kong arcade game in order to attain the skills necessary to compete at it. It is not possible to become proficient at the game in a public setting unless you have a whole lot of quarters and time, and even then a public Donkey Kong arcade machine isn't the easiest thing to find nowadays. This means that a potential competitor needs to either (1) own his own arcade machine, or (2) play on MAME. Needless to say, only a tiny handful of people own (or ever could own) one of the ever-dwindling number of Donkey Kong machines, and even if one of these owners wanted to submit a score, the process is quite involved. That leaves MAME. While MAME is easy for anyone to download, use, and submit for, Twin Galaxies verification requires a specific version of the MAME software, as well as the Donkey Kong ROMset (which is, technically, not legal to download). So, there are prohibitive roadblocks to playing the game at all, let alone competing at it, regardless of platform. Few people are good at Donkey Kong right off the bat. In fact, the game is famous for being very hard for beginners (and, as I will personally attest, continuing to be hard for veterans). It's entirely possible that thousands of people were inspired to set out to achieve a high score and get their name in the books, and were broken by the sheer amount of time (and frustration) that it takes to reach even the first 100,000 points. If you don't have the right mindset, getting good at this game can be seriously un-fun. Who knows how many players started out on the road and abandoned it before reaching a score that merited a submission? The number is impossible to estimate. This Isn't Nerdy Is It? Awareness is one thing, but let's be honest—the King of Kong doesn't exactly make classic arcade gaming look like the coolest new fad, or paint Twin Galaxies from the best angle. The movie is more likely to make you giggle at this world than to want to join it. Aside from three specific people (Mitchell, Wiebe, and Chien), nobody has ever gotten much of anything out of being an elite Donkey Kong player, and it's safe to say that nobody ever will. There won't be a pile of cash and a dozen horny women waiting for you when the score rolls over to a million. In fact, Donkey Kong is a pursuit that offers very little in material rewards, and unless you're doing it for yourself, or achieve the world record (and nothing less), you're probably going to be sorely disappointed when you can't find a soul, even within the classic gaming community, to be interested that you got 500,000 points, or a kill screen, or even all the way to a million. This is a battle between you and yourself. 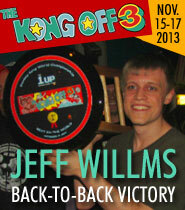 Could it be that the skill to play Donkey Kong well is as freakishly rare as The King of Kong would suggest? I'd like to think it's this one. Reality, however, has demonstrated otherwise. At the time of the film's completion in 2006, there were about five confirmed kill-screeners in the world, and Billy and Steve were the only million-point players. 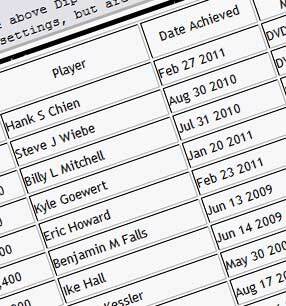 Nowadays, if we include MAME, there are over three dozen players who have reached the kill screen (between four and five kill-screeners have emerged each year since 2007), and of those players, thirteen have scored a million points. This is a considerable increase, and shows that neither Billy nor Steve were quite the "white crows" that the film made them out to be. Still though, it's less than one might have expected. One of my first thoughts upon watching King of Kong was that a movie this successful would transform the landscape completely. I imagined 13 year old whiz kids coming along and crushing both Steve and Billy within weeks of taking up the game, strategy guides, training videos, cheaters, and a general raising-of-the-bar to absurd levels. At least one Hank Chien was inevitable: a contender who would come along to overtake Billy and Steve... but I expected that there would be many Hanks. To get just one new world champ, and a handful of contenders, out of the millions of people who saw and loved the film, didn't exactly constitute a 10 on the Richter scale. The fact that there's still only one player to have beaten Billy and Steve says either that there just aren't that many trying, or that maybe those two really are that good. 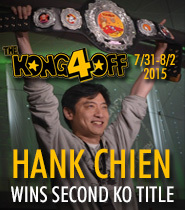 You might be thinking: "the reason few are competing at Donkey Kong is because nobody really cares. They liked the movie; that doesn't mean they want to try to get involved." I would argue that you're thinking like a normal person. When a mass market is involved, there's always some small percentage of oddballs who will be inspired, and that percentage will add up to a lot of people when you're dealing with a market of millions. If newscasts can make jenkem a fad in the US, King of Kong should have had a similar effect on competitive Donkey Kong. And there was an effect. It just seems smaller than it might have been. Regardless of why the wave was no tsunami, part of me is glad that it wasn't. Because it's still cozy here, and cozy is good.